In my always-growing tree of musical influences and heroes, Arthel “Doc” Watson was/is a part of the main body, the trunk...the heart, even. He springs from the roots, of course -- from nearly every strain of early American Southern rural music there was -- but he also branches off and informs so much music that followed. Doc’s passing this week wasn’t a terrible surprise -- he was 89, and in failing health -- but it was a shock nonetheless. 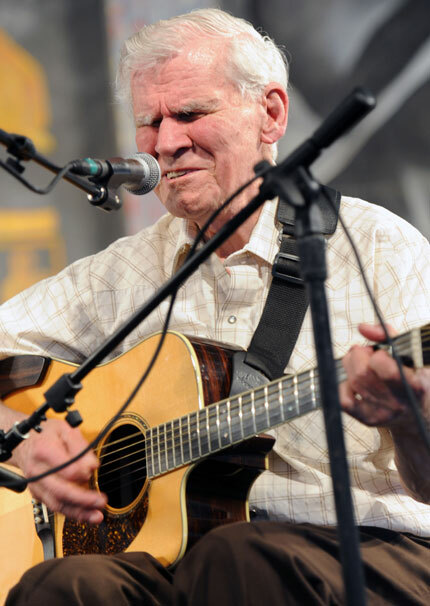 I had never before paused to consider the world without Doc Watson. I’m sure I’m not alone. It’s not that I ever took him for granted. It’s just that he was such a force of nature, an inherent, vital piece of the fabric of American music. I didn’t pause to consider the world without him in the same way that I don’t pause to consider the world without the sky, without fire, without the color green. Like so many people who were touched by Doc’s gifts, it was more than the sum of his virtuosic guitar picking and his plainspoken, unaffected singing that got me. Listening to the recordings he made over the last five decades, or hearing him live (which I was lucky enough to have had the good fortune to have done a number of times), it is/was impossible not to hear more than simply music. Embedded in those performances, part and parcel of their enduring, universal appeal, a person can hear kindness. A listener, without exerting any effort whatsoever, can hear warmth, humanity, humor, grace. Doc Watson’s open mind also greatly influenced me. “I can’t be put in a box,” he told his biographer Fred Metting in 2006, and that was true. Although he incorporated elements of hillbilly music, gospel, country, bluegrass, swing, blues, ragtime, parlor songs, old-time, rockabilly and folk into his unique voice, he was none of these things and he was all of them. You couldn’t categorize the music he made. He made Doc Watson music. Once upon a time I had my own radio show on WVKR, and sometimes I would juxtapose Doc’s renditions of old songs with those recorded by people in other “genres” to help demonstrate the idea that if you go far back enough in American recorded music, all roads lead to one, mythical place where categories and genres burn off and vanish. I might have chosen to spin a song like W.C. Handy’s “Hesitation Blues,” and then play the same song interpreted by Doc, then Louis Armstrong, then Rev. Gary Davis. Later, when I moved to New Orleans to begin what would become my musical career (it wasn’t one then; I was singing for my supper), I brought along a handful of tapes CDs with me. These were the days before portable MP3 players and i-Tunes...whatever music you had, you either made yourself or possessed in some sort of physical form -- in my case it was cassette tapes and CDs. Doc Watson’s Memories was part of that handful of music, and -- listening to it again now, after a long absence -- I’ll be damned if the band I formed down there didn’t perform half of the songs on that record, including the Delmore Brothers' "Blues Stay Away From Me," Jimmie Rodgers' "Miss The Mississippi and You" and the old traditonal “Columbus Stockade." Doc had great taste as a curator of songs. He both honored and kept alive his own heroes, and led us to them. For someone whose music touched untold listeners and influenced generations of musicians, Doc Watson was never a household name. He continued to perform year after year well into his 80s, at country fairs and outdoor festivals and listening rooms, always carrying himself with the greatest of dignity and muted flair. There must have been times when Doc Watson felt bitter or resentful about the fact that his records didn't sell in the millions, or that we wasn't the retro-flavor of the month with the hipster crowd, but he never showed it. Fads came and went, superstars were made and burned out, icons caused seismic shifts in the musical landscape. Doc Watson showed up, sat down on a stool or a chair, and played and sang songs that he loved in an honest, pure and humble way. For five decades. He was a model for growing old gracefully as a traveling musician. Though he would ever as much as admit to it, he was a national treasure. Our music -- a part of who we are as a people -- was in the songs and stories he chose, in his flying fingers, in his steady, firm, loving voice. I wish Doc Watson could have lived forever. I wish my unborn kids could have heard him play. And their kids. And their kids’ kids. It’s hard to imagine my musical experience, my understanding of what music’s function can be, without the profound contributions of Doc Watson. There wasn’t anyone like him, before or since, and I doubt that there ever will be again. I’m grateful to have lived during his lifetime. Thanks Doc. Rest in peace.